While we are waiting for the results of Acell, I (and Commanderfink) thought that it would be good to discuss some positive issues reguarding hair restoration rather that spend all of our time arguing with other forum members whether Acell will work or not…when none of us really knows. Follicawork has brought this up before and I think that it would be good to bring it up again. Dr. Greco (Florida) is working on another hair restoration technique. I’ve contacted him through e-mail and he has been great at getting back to me. I will repost the e-mails he has sent to me to see what you guys think. Honestly, I don’t completely understand what he is doing (I’ve been spending most of my time on this forum checking into Acell) so maybe you guys can read through it and tell me what you think. In the mean time, I am going to contact the list of doctors about Acell again just in case they didn’t read the e-mail (that SPQR) sent to them the first time. Here is the first response that I got. I don’t completely understand the science that he is explaining here, so I hope one of you can interpret for the forum. Fox TV picked up the PRP study from a press release after Bob Brandt and I were awarded a Research Grant from The International Society of Hair Restoration last year. When approached I was rather reluctant because it was a study, but told them it would if they did not sensationalize the work. This is a rather small study because of funding, but we are evaluating the effects of autologus growth factors on miniaturized non-transplanted hair. I will report the findings at the next ISHRS meeting in Montreal Sept 08. The results have been interesting. We already know the PDGF and VEGF are important in hair canal formation and can increase the size and density of the hair shaft. We can show a Case Study where we have injected PRP into an Alopecia Areata patient and the patient grew hair in one month showing that PRP and GF’s turned on the stem cells in the dormant follicles.Will this make a patient with thin hair have thick hair with out HPT, probably not but is has future possibilities. I do not routinely inject PRP for thinning hair, but have been utilizing PRP in hair surgery the past year and half. The benifits are huge in hair transplantation when used in all phases as we do. 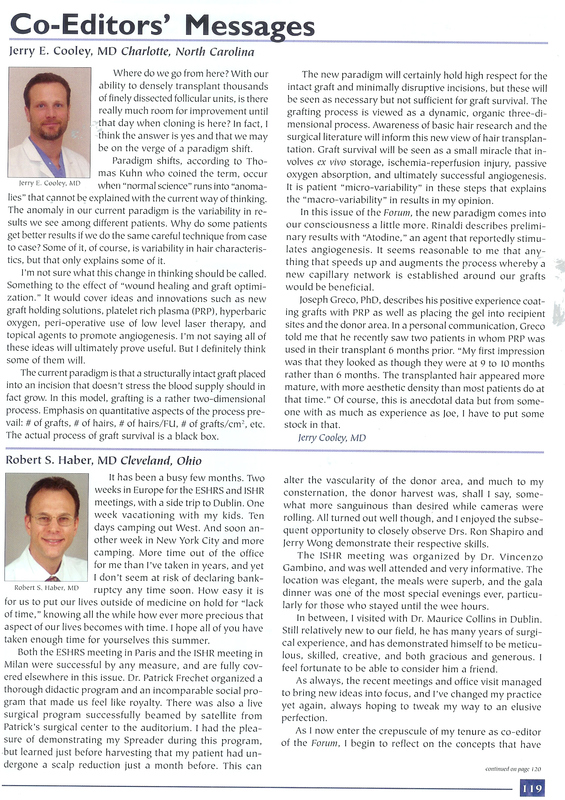 I can send you an article I published in the Hair Transplant Forum how we use PRP. I have been working with Platelet gel 11 years when I was working in orthopedic surgery. I am part of a small Bio tech company that specializes in autologus stem cells and growth factors and my partner, Robert Brandt, is one of the pioneers in platelet gel and has literally done over 28,000 human cases. We have recently formed a new sister company, OroGen Bio Sciences, that will be training physicians in ultrasound guided injections of PRP for orthopedic and sports related soft tissue injuries. This technique will become the medical standard in the next 5 years because it works and it is safe! It repairs torn tendons, ligaments, muscles and avoids surgery in many cases. We also have an equine division at offers treatment for similar injuries. Our product, OroGen Plus, is PRP with a (patented protein matrix ) and is the next generation of PRP. Unlike the ACell matrix, bovine collagen matrix, our matrix is processed from the the patients own cells making it completely safe for humans and animals. We will be conducting research with our matrix, GF’s and hair growth. As are already aware, " it is all about the matrix ". We have used this matrix in human medicine in thousands of case very successfully and are applying it to equine medicine now. I will send you some photos. Below is an e-mail that I received from Dr. Greco. I hope I uploaded the images correctly. I’ve never uploaded anything to this site before. Sorry, I thought it would just give the links to the articles, but it gave the actual articles. 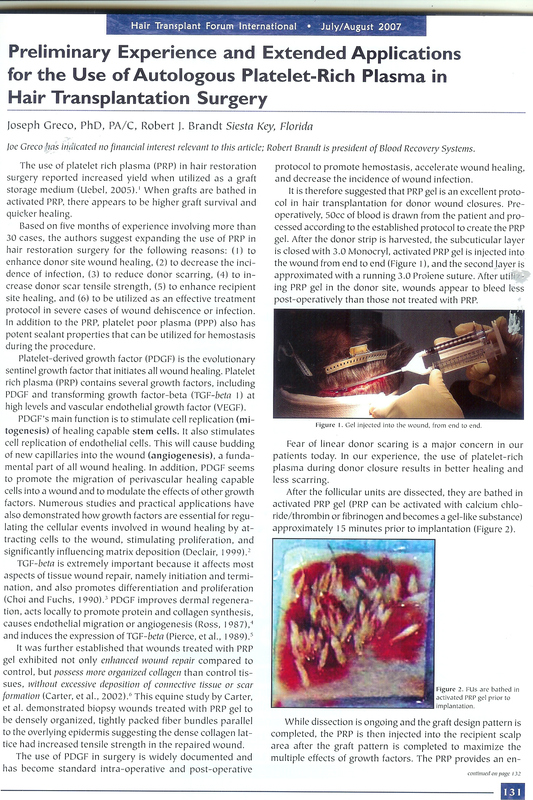 Attached is an article on how to utilize PRP in hair transplantation. I recently presented this at the ISHRS meeting in Rome in May and I feel it has advantages when it is used in all phases of a procedure and it positively affects both transplanted and non transplanted hairs. Additionally, many studies demonstrate less scar collagen because all the cells are organized in a orderly fashion. Do you have the pictures? » send you some photos. These are the only e-mails that I got from him. I don’t know if the few pics in the article (below) are what he was talking about or not. I will e-mail him again and ask about that. Hopefully, in the mean time, some of you guys will read this stuff and break it down for the forum. » Do you have the pictures? » » send you some photos. I e-mailed him again and specifically asked about the photos. Hopefully he responds and has some photos to send (other than the few in the article (below)). I’m going to send them out again this week. we have another doctor adamant about using a ‘matrix’ that induces the body to self repair. Cytomedix claimed to see hair growth with their PRP product; Dr. Greco calims his product will one-up cytomedix’s Autologel product. Some of us have-been following your work on platelet-rich plasma hair treatments. Lately we came across a product called Autologel (www.cytomedix.com/autologel.htm) that parallels your research. Perhaps you could look into this product to enhance your procedure. We’re eager to see it’s results in the hands of a well-regarded physician. Yes, Cytomedix, is the company that has the original patent for PRP and is basicly PRP with vitamin C. The company licenses PRP technology to the large manufacturers and users purchase the processing equipment from various manufacturers. Cytometix is not a reaserch company, but a licensing company that licenses PRP technology. What you will find regarding PRP, is the future is in the “matrix” that allows the growth factors to do their magic. Picture a bridge that has a span missing in the roadway. You can pour all the cement into the hole, but it will just pass through (ie PRP without a matrix), but if you create a foundation from one span to the other ( matrix) the cement will attach to the foundation and a connection will be made from one end of the defect to the other. In other words, Autologel does not have a matrix. Robert Brandt, my partner in a small BioSicences company, does have the missing link matrix, which is patented and we will be marketing it soon. The ultimate protein matrix is one that is derived from the patients own cells because it is the most natural, the safest and is always available. Mr Brandt has done more human cases than anyone (over 28,000) and our OroGen Plus is the next generation of PRP with a proprietary matrix the is proven in thousands of human cases. 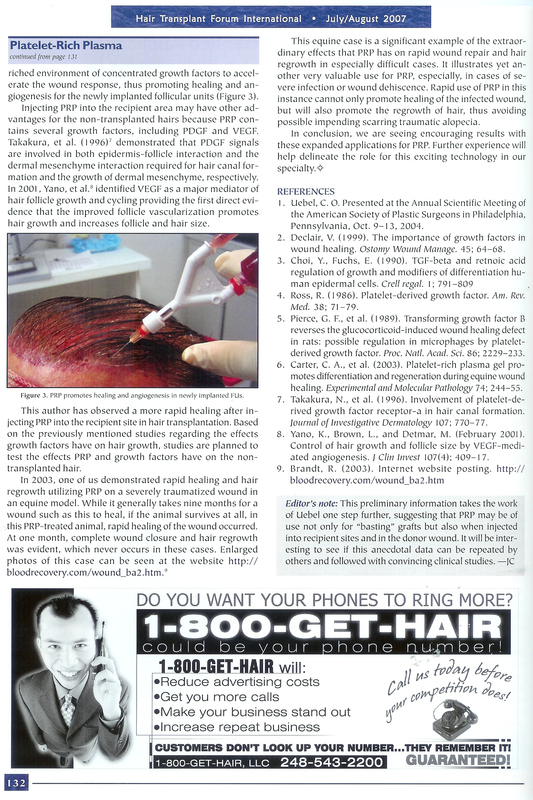 We are continuing our research in hair with this technology, but utilize PRP in our hair restoration surgery daily. Utilizing our bodies ability to heal itself naturally and promote new cellular growth be it tendons, muscle, bone or hair cells is the future of medicine. Thanks for your interest in our studies. Here is the response that I got from Dr. Greco when I e-mailed him about the photos he mentioned in an earlier e-mail. Thank you for the email. I do not have any photos to show at this time because it is a study and I cannot release any photos until the study is completed and presented in Sept at the ISHRS meeting. The study was done to determine if utilizing PRP and the various growth factors have any effect on non-transplanted hair because while using PRP in hair transplantation all the patients seem to look thicker than those who did not use it. Quite honestly, I do not think the aesthetic results will be better or as good as finasteride. What I will send you are some photos of the donor site of a patient who keeps his hair very short after transplantation because this is what most guys are concerned about with linear harvesting.The photos are quite impressive because PRP has been demonstrated to cause less scar collagen and increased tensile strength in a wound. There are studies and slides to demonstrate this as well. Will forward when I get some time. » him about the photos he mentioned in an earlier e-mail. » better or as good as finasteride. » demonstrate this as well. Will forward when I get some time.